The PicoSure Focus Lens Array is a breakthrough technology that is effective in treating uneven pigmentation, wrinkles, and acne scarring. The PicoSure uses a special micro lens that allows for focused levels of energy to be delivered to different layers of the skin. Only 10% of the energy is at a high intensity, which allows for deeper penetration to layers of the skin where collagen and elastin are found. 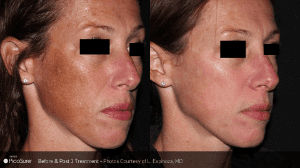 Stimulation of collagen and elastin creates a smoother appearance to the skin, which is what makes this treatment successful in treating textural issues such as wrinkles and acne scars. The remaining 90% of the energy is at a lower intensity when delivered to the skin, which helps to target and treat pigmentation concerns. Controlled exposure of heat allows for better outcomes, shorter downtime and increased safety for the skin. 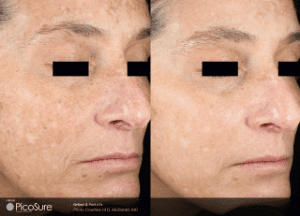 The PicoSure is an easy, non-surgical way to reduce sun damage, brown spots, and fine lines, and is perfect for anyone who desires an overall improvement in the skin related to texture and pigment, but does not have the flexibility in their schedule to take time off to recover. The PicoSure can be used on all skin types, and for the face, neck, chest, arms, hands, and legs. Ideally, you should limit your sun exposure for the 4 weeks preceding your treatment. On that day, you will be provided with topical numbing cream, as well as the use of a Zimmer air cooler during the treatment. The treatment is very tolerable. You may have some very temporary burning and redness that should last less than 8 hours. The treatment takes about 15-45 minutes per area, depending on the size of the area being treated. A series of 3-4 treatments is recommended, spaced at intervals of 2-4 weeks.